It's very satisfying to see your website up there on the web but what's important is not that you can see it but that others can see it too - and are actually visiting it and looking around. Visitor statistics will tell you all you need to know. and a lot more besides. 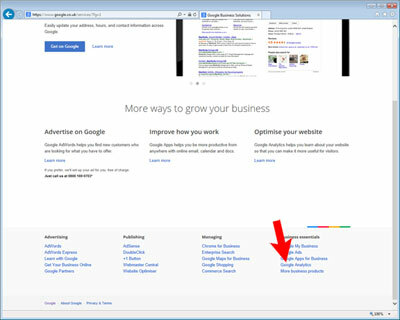 It also integrates with your pay-per-click advertising to show which adverts are the most effective and cost-effective. 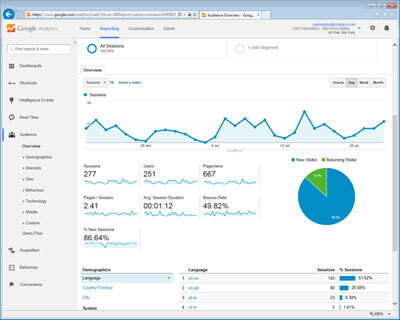 This page is just a VERY brief intro to Google Analytics - whole books can be written about it. Search Google for more and you'll not be disappointed! Other web stats are available! Google Webmaster Central also has more technical information about your website, such as page errors, search frequency, and some tools to check the site is being indexed correctly. Webalyser stats are also available if required, however the range of information available is more limited and the interface a little old fashioned by today's standards. 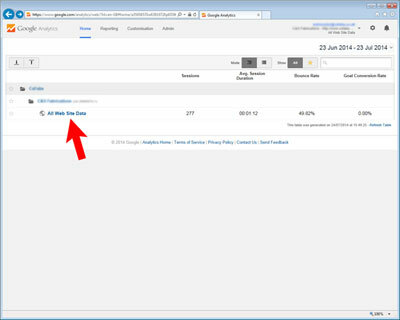 We install Google Analytics to almost every website we build so all you have to do is login and see how you're doing. 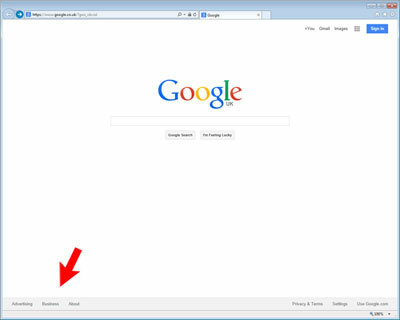 Start by pointing your web browser to www.google.co.uk (or .com if you prefer) and click the link to 'Business' at the bottom of the page. 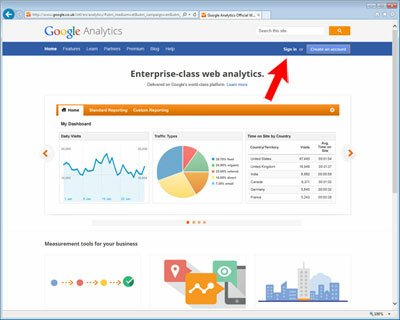 Scroll the Google Business Apps page to the bottom and click the link to 'Google Analytics' on the right - under 'Business Essentials'. Enter the user name and password for your Google account. If we created an account especially for Analytics we will have emailed the login details to you. If you gave us permission to use your existing Google account you should login with your normal user name and password. If you have more than one website you must now choose which website to examine. Mostly there will just be one account, for one website, so click it to open your Analytics. A graph of daily visitor numbers - you can change the range of dates to view. The number of visitors and visitor sessions - a returning visitor will record more than one session. The average length of a visit and the number of pages viewed. The 'bounce rate'. This the percentage of visitors who looked at only one page and then left and tells you if your marketing efforts are working and your search terms are well chosen. A figure of less than 50-60% is considered good. Click items in the menu on the left to see more detail.